Set a steaming basket over a pot of boiling water, carefully arrange the kabocha wedges so that they do not stack or overlap, cover the pot and cook for 10-12 minutes. Meanwhile, place the butter in a small sauce pot and cook until is completely melted and beginning to brown, then stir in the miso paste, remove from heat and whisk in the maple syrup and water, continuing to whisk until smooth and emulsified. Remove cooked squash from the steamer and arrange on a plate. 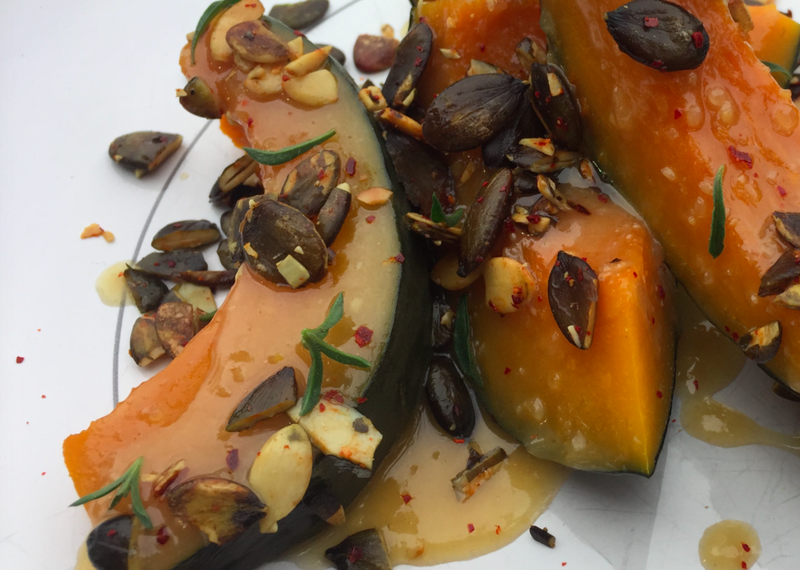 Using a pastry brush or spoon, brush or drizzle the miso/maple glaze onto the kabocha wedges, squeeze the lemon juice over top, then finish with the toasted seeds and a sprinkle of crushed chili flake.